With many new seating technologies, models and types of wheelchairs on the market, you want to make sure you pick a wheel chair that fits your body, preferences, lifestyle and activities you do. At Lakeside Rehab we have specialists to assist you with the entire process. Please read on what we can do for you. One on one evaluation by a Physical Therapist with special wheelchair fitting expertise and wheelchair vendor to help you to discuss and take all the following elements into consideration: Medical and Physical Considerations (please see below), caregiver considerations, financial considerations. Please make sure your care taker(s) are present for the evaluation session as well. They offer valuable input on patient’s lifestyle, activities as well as home setting. Submission of prescription and documentation. We will work with most vendors and insurance companies that provide coverage for your new wheelchair. Wheelchair vendor will confirm the delivery of wheelchair with the patient, do on-site final fitting and test drive of the wheelchair, provide training on how to use your new wheelchair safely. If patient is not able to come to clinic, our office will schedule a time to do the evaluation at their home or center (like Cherry Blossom Home for the Aged, Ludington Woods Assisted Living, etc.). Therapist will come to see the patient with a vendor together, unless a standard folding chair with standard foot rest is needed. Did we mention that our facility is Wheelchair Accessible? We also have dedicated parking spots for handicapped parking at the front of the building. We are willing to work with any wheelchair vendor. Recently we have worked with Air Care, Care Link, Wright and Filipps, Orbit and many more. Our Physical Therapist will review your medical history and use this information to justify (to the insurance company) the wheelchair and seating system you need and to ensure that medical issues are properly addressed. Newly injured individuals: If this is your first wheelchair, you will likely need more advice on the technology that will best suit your needs. In addition, you may continue to have physical changes or recovery over the next several months, in which case this first chair may only be temporary. As a result, the team may recommend a rental chair or more frequent follow-ups. Long-time injuries: If you have been using a wheelchair for a long time and have developed new problems, such as weakness or pain, you may need to make changes to your current wheelchair seating system. Age affects endurance and strength and may be a deciding factor between a manual or power wheelchair. Strength and range of motion will determine whether or how much you can push your wheelchair, transfer in and out of your wheelchair, lift and fold your wheelchair, etc. Height and weight will affect what size wheelchair you will need. Trunk stability: The higher your level of injury, the more unstable you are likely to be, and this requires extra attention to seating and position to enhance stability. Functional abilities: Your level and completeness of spinal cord injury will affect how much function you have in your arms and hands and whether you will need a power or manual wheelchair. Medical conditions or risks: Conditions such as spasticity, previous pressure sores, or urinary leakage can also affect wheelchair selection and should be discussed with our Physical Therapist. It is important for the people who care for you to be able to work with your wheelchair, which may include pushing it occasionally or lifting, folding, fixing, cleaning or adjusting the wheelchair. Home: Is your home carpeted? Are entrances to your home steep? Are there difficult surface conditions that a wheelchair might need to push over, such as gravel or grass? While you may make changes to your home to accommodate a chair, it is also possible that chairs exist that can help you when changes to the home environment are not possible or desired. Work: What will you be doing for work, and how does your wheelchair need to fit into that environment? For example, will your wheelchair fit under the conference room table where you meet twice a week? Transportation: Will you be driving your own vehicle? Van or car? Will someone else be driving you around? Will you be taking public transportation? Leisure activities: Will you spend time outdoors on grass or hiking on trials? Will the wheelchair also be used for sports? Personal taste/preferences: For example, some people may prefer a sportier-looking chair or a specific color (but note that something other than the standard color may cost more). Insurance coverage: This is often a major consideration when choosing a wheelchair and may limit your choices. However, it is best to choose the optimal chair first, then consider your financing. 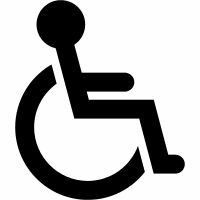 Other financial resources: Local resources to assist in purchasing your chair may be available through organizations such as United Cerebral Palsy or the Multiple Sclerosis Society. Despite their names, these organizations often help people with any disability. Some individuals have fund-raisers through their church or temple. Please let us know if you have any questions. You are welcome to call us at 231-873-3577 or click here to send us a message. We are looking forward to assist you with your next wheelchair fitting.